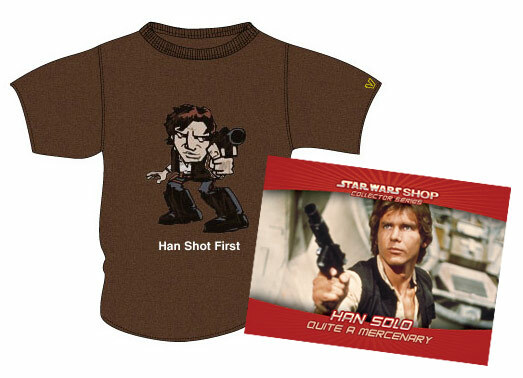 END TIMES DEPT: Hot on the heels of Microsoft and Novell’s announcement that they will work together to support SuSe Linux, the official Star Wars Web site is selling a “Han Shot First” t-shirt to promote the release of the original theatrical versions of the trilogy on DVD. “Han shot first” is, of course, the rallying cry of Star Wars fans who took exception to much of Lucas’ digital tinkering with the original movies. Specifically, the clumsily-reworked scene in which Han Solo only shoots bounty hunter Greedo after Greedo has fired at Han first and somehow missed from a distance of three feet across a barroom table. This release will only be available for a limited time: from September 12th to December 31st. Oh my God, I think I’m actually hyperventilating.